Natural & Artificial Flavors, Silica, Sucralose, Acesulfame-K, Maltodextrin, & FD&C Blue No. 1. RESURRECT-P.M. is an extremely powerful sleep and recovery supplement strictly intended for use by healthy adults 18-50 years of age. To assess your tolerance to RESURRECT-P.M., start by consuming 1/2 scoop 30 minutes prior to sleep. Recommended serving is 1 scoop mixed with 6-8 ounces of water on an empty stomach 30 minutes prior to sleep. Take RESURRECT-P.M. for 5 days in a row and then take 2 days off. Do not exceed more than 1 scoop per day. Allow for 6-8 hours of sleep after using. RESURRECT-P.M.™ is intended for use by healthy adults 18-50 years of age ONLY. To assess your tolerance start by consuming 1/2 scoop 30 minutes prior to sleep. Recommended serving is 1 scoop mixed with 6-8 ounces of water on an empty stomach 30 minutes prior to sleep. Take RESURRECT-P.M.™ for 5 days in a row and then take 2 days off. Do not exceed more than 1 scoop per day. Allow for 6-8 hours of sleep after using. KEEP OUT OF REACH OF CHILDREN. Do not exceed recommended dose. Consumer must be at least 18 years of age to purchase and/or use this product. Consult your physician prior to using this product or any supplement if you are pregnant, nursing, taking medication, have sleep apnea, narcolepsy or other related sleep disorders. Absolutely DO NOT consume with alcohol, prescription or over the counter medication including but not limited to sleep aids, opiates, or anti-depressants. This product contains chemicals that are known to the State of California to cause cancer and/or birth defects or other reproductive harm. Do not take this product if you are at risk or are being treated for any pre-existing medical condition including but not limited to: high or low blood pressure, cardiac arrhythmia, stoke, heart, liver, kidney or thyroid disease, seizure disorder, psychiatric disease or disorders, diabetes, difficulty urinating due to prostate enlargement or if you are taking an MAO inhibitors (MAO). Discontinue use and consult your health care professional if you experience any adverse reaction to this product. Discontinue use 2 weeks prior to surgery. Natural & Artificial Flavors, Citric Acid, Malic Acid, Silicon Dioxide, Sucralose, Acesulfame Potassium, & FD&C Red #40. Manufactured on equipment which processes products containing milk, egg, soybeans, shellfish, wheat, and tree nuts. Natural & Artificial Flavors, Silica, Citric Acid, Malic Acid, Sucralose, Acesulfame-K, FD&C Blue No. 1 & FD&C No. 40. Resurrect-P.M.™ is an extremely powerful sleep and recover supplement strictly intended for use by healthy adults 18-50 years of age. To assess your tolerance to Resurrect-P.M.™, start by consuming 1/2 scoop 30 minutes prior to sleep. Recommended serving is 1 scoop mixed with 4-6 ounces of water on an empty stomach 30 minutes prior to sleep. Take Resurrect-P.M.™ for 5 days in a row and then take 2 days off. Do not exceed more than 1 scoop per day. Allow for 6-8 hours of sleep after using. Caution: Red entire label before consuming! Magnesium (as Magnesium Aspartate), Zinc (as Zinc Sulfate) & Vitamin B-6 (as Pyridoxine HCl). Silica, Magnesium Stearate, Rice Flour & Gelatin. Ronnie Coleman has trouble sleeping. In fact, he's always had trouble sleeping, even when winning bodybuilding championship after championship. Winner of eight Mr. Olympia titles, proves that sleep is possible even for the busiest guy on the planet. His secret in a bottle, Resurrect PM, can help you rise from even the busiest days and hardest workouts. Bodybuilding is like a chair with three legs. You need all three if you want the right balance. The first leg is about the right nutrition. The second is the right workout. Finally, the third leg is about rest and relaxation. Sleep is when your growth hormones are firing and helping your body grow, repair, and recover. But you can do even better - take certain amino acids like those that are in Resurrect PM, and naturally boost HGH production even more, while they help you sleep deeply too! R&R is Important for Growth! Sleep is still an important part of a healthy bodybuilding regimen. Many complain that they don't really get that much sleep with work, taking care of kids, or joining competitions. It's a question that Ronnie struggled with for years. His journey to winning 8 straight Mr. Olympia titles meant he had to travel a lot, spend time with his family, workout and still maintain his nutrition. His secret was the quality of sleep he got. And that means REM sleep or "rapid eye movement" sleep. Finally, Ronnie shares his secret formula to getting deep REM sleep. It's a special formulation of the ingredients he took during the height of his career. 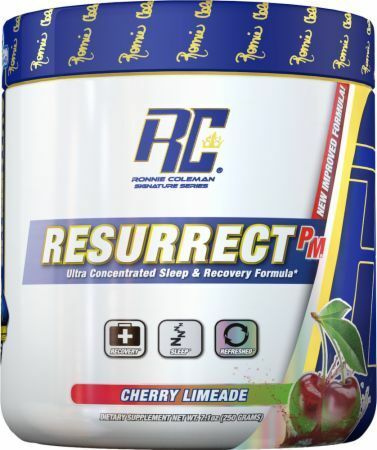 Resurrect PM is guaranteed to help your body achieve quality sleep for great muscular gains. Consider sleeping on an 8 hour plane ride. You'll might remember finding out that on touchdown, you were still just as sleepy as you were before the flight. That's because the sleep you got wasn't REM sleep. It's the stage of sleep that allows dreaming while completely relaxing your muscles. REM sleep is also one of the two states of sleep where the body produces more growth hormone. You can now achieve this with the help of Ronnie's Resurrect PM. The main stars of this proprietary blend are GABA and Mucuna Pruriens. They both have a profound effect on sleep. In several studies, GABA helped put test subjects into restful sleep. The rest of the ingredients support GABA such as Theanin. L-Theanin is one of the few "antidotes" of caffeine induced insomnia. Overall, this mix is a powerful one and guaruantees rest and relaxation once it enters your body. Since its release, it has garnered many positive reviews. It simply tastes great, and that's just a nice thing to have before bed. 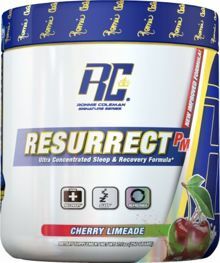 The ingredients of Resurrect PM helped many customers get quality sleep and even help banish over-sleeping! Adults may smirk at the little kids during nap times but it's the kids that get the last laugh as they experience growth spurts. Kids do get quality sleep, after all, they don't deal with daily stress on the job and being the bread winner of the family. Resurrect PM can help you get that sleep and retain some of the growth spurt. Cortisol is the enemy of many bodybuilders. It's responsible for destroying muscles or something called muscle atrophy. However with quality sleep, you can reduce Cortisol levels naturally. It's no secret, quality sleep can help boost growth hormones. We're talking about REM sleep here, something that Resurrect PM is going to give you. Lastly, sleep also helps cells grow by optimizing nutrients for cell division. It's during at rest when the majority of resources are diverted to repair and growth. It's during this time that you gain/grow new muscle cells! You can count jumping sheep or drink buckets of warm milk and still be awake. Or you can take Ronnie Coleman's Resurrect PM for that quality sleep that counts. Dattilo M, Antunes HK, Medeiros A, Mônico Neto M, Souza HS, Tufik S, de Mello MT., "Sleep and muscle recovery: endocrinological and molecular basis for a new and promising hypothesis." Gottesmann C., "GABA mechanisms and sleep." Jang HS, Jung JY, Jang IS, Jang KH, Kim SH, Ha JH, Suk K, Lee MG., "L-theanine partially counteracts caffeine-induced sleep disturbances in rats."